I'm the muse this week for the Muse Card Challenge! I hope you'll be inspired to make something pretty and enter the challenge. This card was quite easy. Watercolored the panel, using as little water as I could. Too much water and it results in hard line edges, which I did not want on this card. Waited for panel to dry. Let panel dry and covered with embossing buddy. Stamped sentiment with Versmark and embossed in white. Tied embroidery floss and adhered to kraft card. Added white dots in center with gel pen. Hero Arts watercolor flower set (this is an old set and I do not know the name) Libby Hickson let me know it is CL 431 Watercolored Petals. Thanks! As my husband would say, so get yourself in your craft zone and go create! Love your watercoloring, then the markers on top! 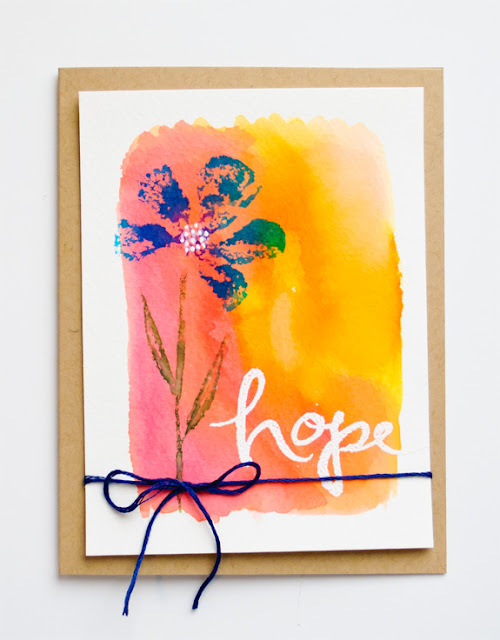 Love those rich watercolors and the white embossing. Very pretty! This is such a beautiful card! This is so pretty! Thanks for explaining your process!